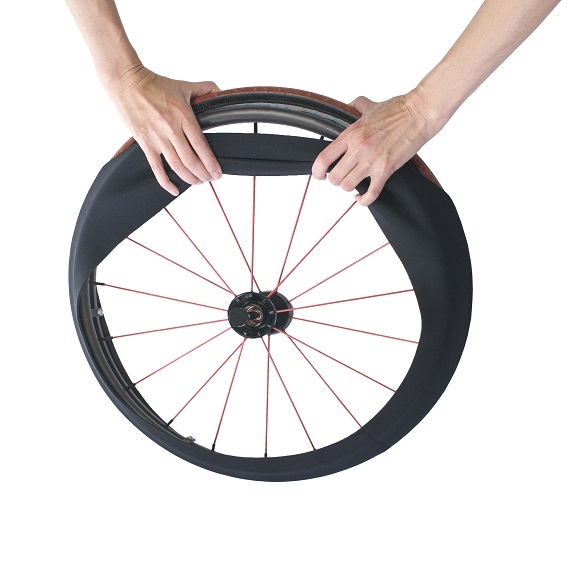 Did you ever stop to think about all of the dirt and germs you bring inside on your wheelchair tires? Have you﻿﻿﻿﻿﻿﻿r tires ever left black marks on the floor or tracked mud on a carpet? When able bodied people go inside, they often take off their shoes and put on their slippers of socks. Now wheelchair users can put on their slippers and socks too! RehaDesign Wheelchair Slippers and RehaDesign Wheelchair Socks! What are they? * cover the wheels to help prevent dirt, germs and marks from transferring to the floors. Measure your caster diameter as shown above, and click below to select the diameter of your wheelchair caster and to add Wheelchair Socks to your basket. The price is for 1 pair (2 pieces) of beige wheelchair socks.